400 gallon acrylic corner aquarium complete salt water system, including dual bio sump chambers, dual U V lights and protein skimmer. 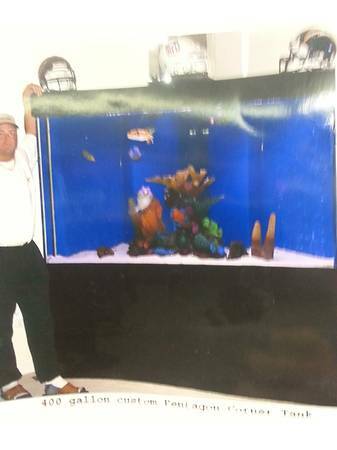 The tank is 1″ thick acrylic, approximately 4 feet off each corner and over 6 foot across the front, on the stand with canopy it sits about 7 feet tall. The Hood and base are black acrylic. The back wall is a brilliant blue. 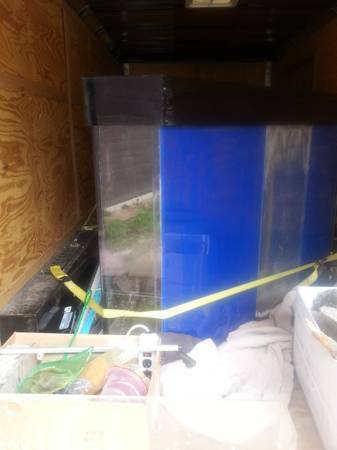 The Tank is 10 yrs old and was originally 11,000.00 , It was recently purchased for a doctor’s office but would not fit though a standard door, you must have a large window or door wall to fit aquarium.